Slim Jim: Build Your Own Basket. This post is sponsored by Mirum, but opinions expressed are my own! I only work with and share brands I know and love. With Easter fast approaching and my Brennon not loving candy as much as the other kids in our family, I knew I needed to find an Easter Basket Idea that didn’t have candy. This Slim Jim: Build Your Own Basket is perfect for anyone, child or adult, that doesn’t care too much for the sweeter treats of the season! I, myself, love the sweeter treats. I much prefer them, in fact. I’m excited for Brennon to wake Easter morning, search out his hidden basket (I’m thinking of hiding it in his own closet this year. 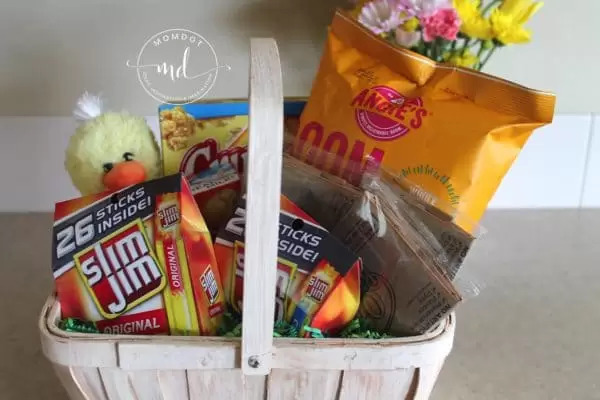 Sometimes hiding something closer to them is the best place to hide it, since it’s the last place he’ll think to look), and see that being creative with an Easter basket doesn’t have to include the more commercialized candy of the season. Placing the tallest items towards the back of the basket first, I got started. To give some added height, I placed the Walmart bags from the recent purchase under the desired item. This made it so I could angle it away from the bagged popcorn, giving a great backdrop to the basket. Moving forward with the next biggest item, I realized that I wanted this one to angle slightly as well, so I added more plastic bags underneath. Liking the look, I covered the bags and the remaining space of the basket with the colored Easter grass. Tip: Make sure that you leave a bit of the grass behind, giving yourself extra to decorate the empty spaces once everything is in place. Continue adding the various items, making sure that you place the smaller of all items in the front. Because I didn’t have enough space for the box of microwaveable popcorn, I opened the box and added three individual bags to the basket. With everything added to the basket, use the remaining grass to fill in the open spaces. I added a bit behind the bagged popcorn, between the Snack Pack and the bagged popcorn, and in front of the Slim Jim gabled boxes. It doesn’t have to be a lot, and doesn’t have to be pressed down hard, just enough to make it look decorative. Taller items in the back, smaller in the front, this basket is bursting at the seams with both savory and sweet goodness! Wanting to finish off the basket, I added a decorative Basket Bow. I think it makes the basket more Easter complete. What about you? Does anyone you love not care for candy? Would this basket be perfect for someone in your life? Below is a virtual Easter basket I created. It’s called the Slim Jim BYOB – Build Your Own Basket. 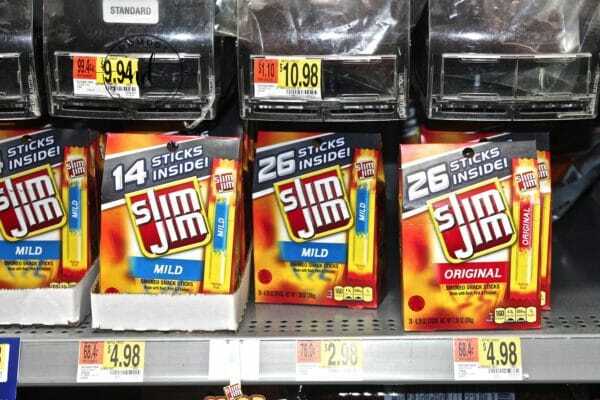 For a chance to win a $100 Walmart gift card, go to the Slim Jim Site to create your own. NO PURCHASE NECESSARY. Void where prohibited. The Slim Jim Build Your Own Basket Sweepstakes is sponsored by Conagra Brands, Inc. Open to legal U.S. residents of the 50 U.S. & D.C., 18 & older. Begins 12:00 a.m. PT on 3/1/18 & ends 11:59 p.m. PT on 4/1/18. Twenty potential winners will be randomly selected to each receive a $100 Walmart eGift card. Total ARV: $2,000. Odds depend on number of entries. For full details see official rules at SlimJimBoldBreak.com.